20/20 just means that the person can clearly see a certain letter on the standard eye chart (equivalent to what a person with normal vision should be able to see at 20 feet). There's so much more to healthy vision than 20/20! Is vision clear and single at close distances? Clear sight at short distances is critical to reading, writing, close work, computer use, etc. Do the two eyes aim, move, and work as a coordinated team? Weaknesses in binocular (two-eyed) vision and eye teaming skills can cause numerous difficulties, including convergence insufficiency and poor depth perception. Do the eyes maintain clear vision at varying distances? Rapid, automatic eye focus adjustment is critical to learning, reading, writing, sports, etc. 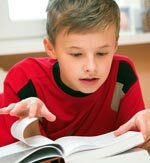 Deficiencies can cause visual fatigue, reduced reading comprehension, and/or avoidance of close work or other activities. Do eye movements show adequate muscle control, tracking, fixation, etc.? In the classroom, normal eye movements allow rapid and accurate shifting of the eyes along a line of print or from book to desk to board, etc. In sports, efficient eye movements contribute to eye-hand coordination, visual reaction time, and accurate tracking. Is confusion or reversal of letters or words (b, d; p, q; saw, was; etc.) within the normal ranges for a given age? Past the age of seven, frequent visual and written reversals might indicate a visual perceptual dysfunction. Above are just a few of the many visual skills evaluated during our comprehensive vision exam. In addition, the health of your eyes, inside and out, is carefully evaluated for such problems as cataracts, glaucoma, hypertension, diabetes, etc. The American Optometric Association recommends that pre-school children receive a complete vision exam at the ages of six months, three years and five years. It is particularly important that a child have a complete evaluation in the summer prior to entry into Kindergarten. While in school, yearly evaluations are recommended. The American Optometric Association recommends a yearly eye exam for adults -- not only to detect and to diagnose vision changes or problems -- but, also to maintain eye health. For example, glaucoma, a disease caused by increased pressure in the eye, commonly goes unnoticed by adults. Regular vision examinations are also important for the prevention of vision problems created or aggravated by today's academic and professional demands. 21st century lifestyles demand more from our vision than ever before. Adults in our technological society constantly use their near vision at work and at home. Environmental stresses on the visual system (including excessive computer use or close work) can sometimes induce headaches and/or visual difficulties which can be effectively treated with corrective lenses and/or Vision Therapy.